Hey there friends. I purchased Rock Band 3 this weekend and I must say that I am definitely pleased with the song selection. Even though there were many songs got us singing, the hits of the night were definitely Bohemian Rhapsody, Freebird, and Break on Through. Keep an eye out on my review which should hit tomorrow. I just entered a contest in hopes of scoring a free 12 song downloadable pack of Bon Jovi songs. 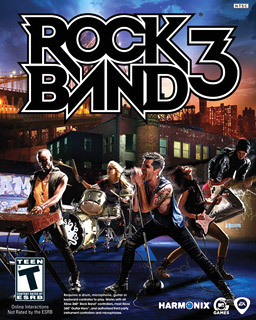 Bon Jovi is another personal favorite to play on Rock Band. My bro and I get "the band together" and just have fun with it. My bro can't sing for "crap" but he claims that he's not a singer, he's an entertainer so we let him do his thing. And that's what makes it fun. lol If I'm a chosen winner, we'll definitely be out at my place rockin' the night away. Serious Jovi fans (or those just like to have fun with it) are welcome! lol Later!